“are you going to eat that pickle?” is something that you would likely hear either myself, kristal, or maria say. we are obsessed with pickles. if you are halfway done with your burger and haven’t touched your pickle, you better have a good reason why, or else i’m snatching it up. the movie theaters used to sell whole pickles for 99 cents [back when it cost less than 5 bucks to watch a movie]. in high school, i told my boyfriend at that time that i wanted (him to buy me) a pickle. not only did he refuse (out of principle, not because he was cheap), but he told me that my breath would stank and wouldn’t kiss me for the rest of the night. needless to say, i chose the pickle over kissing. duh. pickles are SO easy to make, i don’t know why i never made them before. Cut the cucumbers into spears or slices, whatever you fancy. Place them into a strainer and drizzle salt all over them. 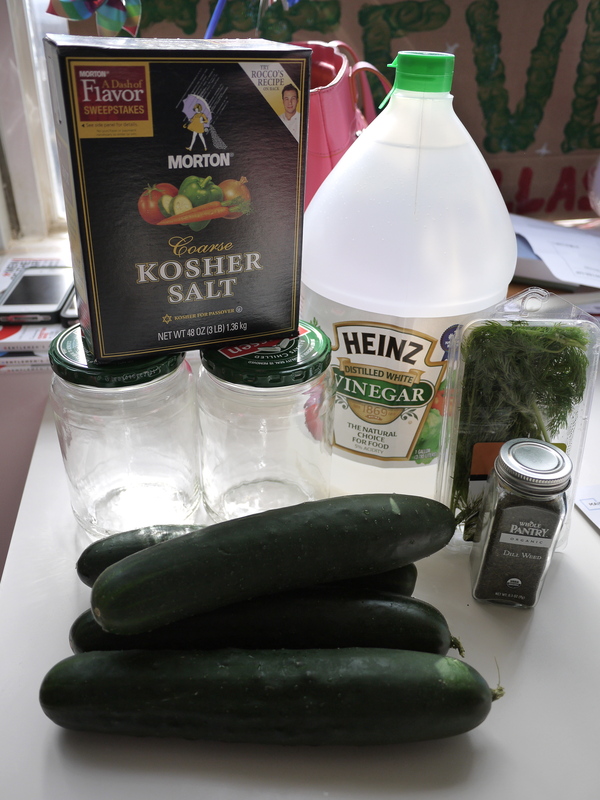 The salt will draw out the water, which makes for more crisp pickles and it also absorbs more of the vinegar flavor later. Place in the fridge and let the pickles sit in salt for 1 hour; be sure to put a bowl or plate underneath to catch the liquid. 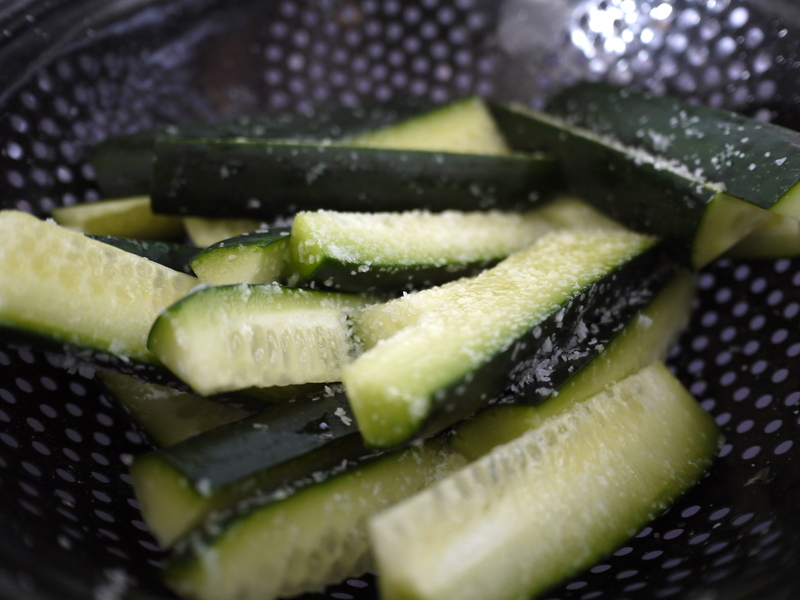 After an hour, rinse the cucumbers in water to remove the salt. Pat dry with paper towels. 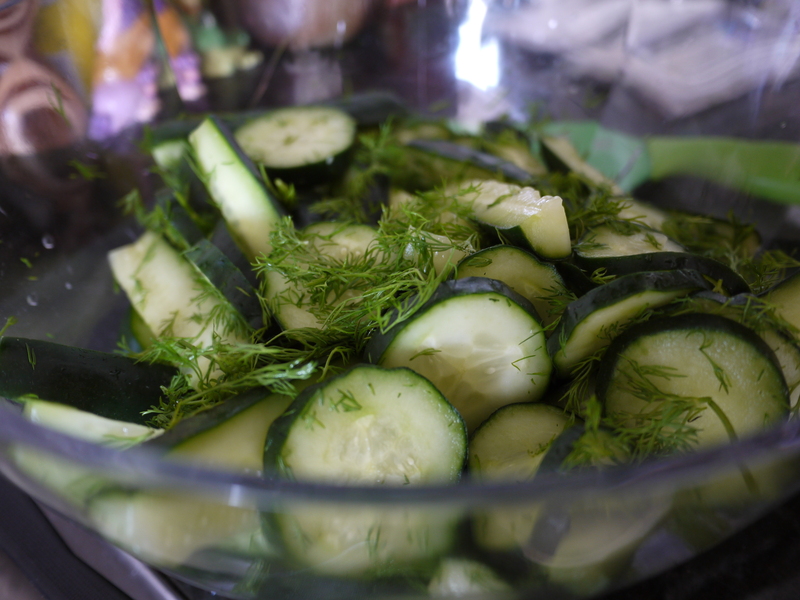 Chop up lots and lots of dill weed and mix it in with the cucumbers. Bring three cups of vinegar and two cups of water to a warm semi-boil. 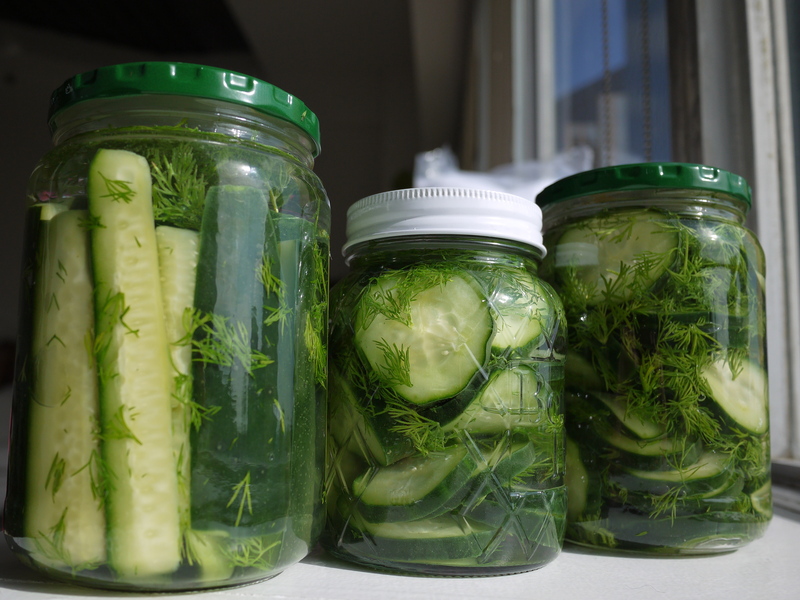 Place the cucumber spears/slices and dill weed into the pickle jars. Pour the vinegar mixture into the jar and seal. Refrigerate for at least one week. The longer, the better. Yes, waiting one week is the hardest part. Hey Emily! I LOVE your blog! I didn’t know you’re also into cooking experimentation. One of these days, I’ll have to write a post on the crazy meals we’ve been able to throw together in rural Kenya with the limited ingredients and 2-burner stove we have here. Keep up the experimentation and inspirational posts!